That’s according to a new report from the nonpartisan Citizens Research Council of Michigan (CRC) a Livonia-based public policy organization that was released last week during the Michigan Municipal League’s (MML) annual conference in Lansing. While fixing the state’s roads has gotten most of the headlines — and is the centerpiece of Gov. Gretchen Whitmer’s fiscal year 2020 budget — the report’s authors stress that transit also needs to be viewed as an important driver for economic development. The report argues that urbanized regions around the state need to adopt more of a regional approach for transit when it comes to both funding and governance. In successfully doing so, the state could see less stress and congestion on its roads — which already need at least an additional $2.5 billion annually in new funding — while improving air quality and reducing barriers to mobility. According to MML Executive Director and CEO Dan Gilmartin, Amazon rejecting Detroit’s bid to host its second headquarters last year should stand as reason enough for policymakers to make transit a main priority. The Seattle-based e-commerce giant cited, in part, Southeast Michigan’s lack of a cohesive transit strategy as a reason that the city didn’t even crack the top 10 places Amazon considered for its expansion. The headquarters ultimately went to northern Virginia outside Washington, D.C., and New York City. Amazon, however, reversed course and withdrew its New York plans amid an outcry from citizens over the proposed incentives. Amazon was upfront about ready access to public mass transit options as a key factor in its decision-making. “In Michigan, we flunked that test,” Gilmartin said during a news conference, adding that until Michigan invests in transit infrastructure, the state will struggle to attract sizable corporate investments. For decades, transit debates around the state, especially in the Motor City, have been a bumpy ride for politicians and citizens alike. Metro Detroit stands as one of the only major metropolitan areas in the country without a single, cohesive transit agency. In its stead, the Detroit Department of Transportation (DDOT) operates buses in the city of Detroit, while the Suburban Mobility Authority for Regional Transportation (SMART) operates in certain suburban communities that don’t opt out of the service. The CRC’s report says that the state Legislature could pass laws that would make it harder for municipalities to opt out of that service. Politicians and voters in suburban communities in Oakland and Macomb Counties have routinely stymied efforts to implement a unified transit authority across the region. The existing patchwork of systems creates hurdles for commuters, especially low-wage Detroit workers who rely on transit to reach retail jobs in suburban communities like Novi and Livonia, as Crain’s Detroit documented last year. Communities that opt out don’t understand the key role that transit can play in a region’s economic development, said CRC President Eric Lupher. “When you look at successful places, [transit] is not just a service for the poor and it’s not just a service for the carless,” Lupher said. “It’s a choice. People want to use that. While metro Detroit has struggled to step up its transit offerings, the Grand Rapids region on the other side of the state has found success in recent years. 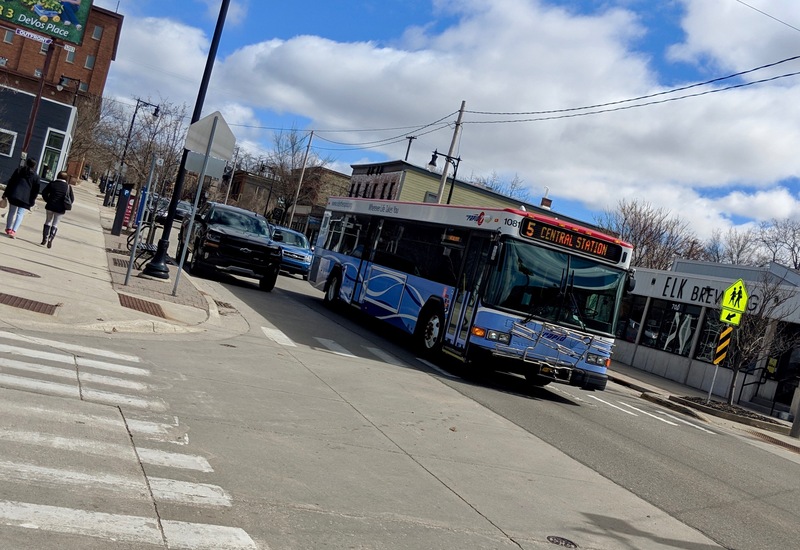 Next month, the Interurban Transit Partnership (ITP), which operates The Rapid bus service in Grand Rapids and its surrounding suburbs, plans to begin construction on its second bus rapid transit (BRT) route. BRT is designed to operate akin to light rail, often using dedicated traffic lanes during peak times. Buses are sometimes even equipped with technology that can change traffic signals as they approach. The route, which will connect downtown Grand Rapids and Grand Valley State University’s main campus in Allendale to the city’s west, is funded with a combination of federal and state grants. Beyond just benefiting commuters and those without cars, planners often hope that enhanced transit can spur economic development. But that development has been slow to materialize with The Rapid’s first BRT line in West Michigan, as publication MiBiz reported last year. To that end, the CRC’s Lupher said that transit agencies in Michigan need a voice and a seat at the table when it comes to municipal planning and zoning. That’s a key factor in how Michigan’s transit is funded. Right now, municipalities that want to make transit improvements can only use the property tax, a state of affairs which Lupher called “nuts.” Lupher noted that several other cities and regions around the country have been able to levy special sales taxes along with other revenue mechanisms to invest in their transit infrastructure. “When it comes to services that benefit an entire region, but that will not be spread equally across a region, property taxes are not a good fit because it is more difficult to see the connection between living in a particular community and getting the benefit of the tax,” the CRC’s report said. Convincing a Republican-controlled Legislature led by policymakers from rural areas of the state to invest in transit — and allow Michigan’s cities to levy special taxes — is sure to be a heavy lift politically. Still, the MML’s Gilmartin said that better transit in Michigan is a matter of straight-up economics that will lead to more jobs for Michiganders.